Not many - if any - musical biographies open with quotations from Richard M. Nixon. But DJ Vadim, a.k.a. the John Coltrane of hip hop, ain't exactly your average 'round-the-way' producer. A veteran traveller and quality purveyor of head-nodding beats, Vadim has 4 solo albums, 2 group albums (One Self; The Isolationist), a remix album, countless mix tapes/CDs, EPs, remixes plus a slew of 12s and 7s under his heavyweight belt. Needless to say, though producer/DJ's these days are a dime-a-dozen, a veteran like Vadim is not the kind o' cat to release 12 tracks of the latest in-vogue soul loop. In fact his new album, "U Can't Lurn Imaginashun" is one of the sickest joints on the block, continuing - and embellishing - the producer's inventive journey into the realm of sound. Anyone that knows anything about Vadim knows to expect the unexpected, and "UCLI" has surprises - and dopeness - in abundance. Not many - if any - musical biographies open with quotations from Richard M. Nixon. But DJ Vadim, a.k.a. the John Coltrane of hip hop, ain't exactly your average 'round-the-way' producer. A veteran traveller and quality purveyor of head-nodding beats, Vadim has 4 solo albums, 2 group albums (One Self; The Isolationist), a remix album, countless mix tapes/CDs, EPs, remixes plus a slew of12s and 7s under his heavyweight belt. Needless to say, though producer/DJ's these days are a dime-a-dozen, a veteran like Vadim is not the kind o' cat to release 12 tracks of the latest in-vogue soul loop. 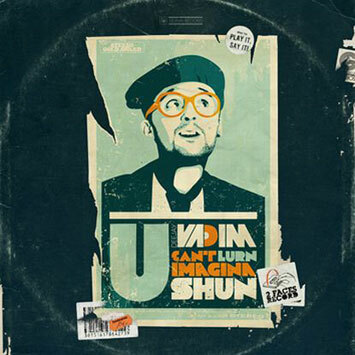 In fact his new album, "U Can't Lurn Imaginashun" is one of the sickest joints on the block, continuing - and embellishing - the producer's inventive journey into the realm of sound. Anyone that knows anything about Vadim knows to expect the unexpected, and "UCLI" has surprises - and dopeness - in abundance. Which is extra impressive considering the last year has not been Vadim's happiest. "2008 has been the worst year of my life," he reveals. "I went through the most gut-wrenching emotions due to family trauma and personal health. My father went partially blind after having three failed cataract operations. My mother nearly lost her house in the credit crunch and ended up having anxiety attacks. My wife had a bad illness and I went blind in my left eye. I was diagnosed with eye cancer in summer and had a very precarious operation to remove it. For the first time I had to dwell on the idea of death and not being invincible. I saved my eye, got rid of the cancer and since then I have gone on to complete a new album." Out of the negative comes the positive. And "U Can't Lurn Imaginashun' is all about mining the deepest parts of the psyche to find inspiration. It's about how, even though we learn so much at school - courses in languages, computer studies, science, religion, sport - and live in a time of unprecedented technological prowess (phones, computers, ipods, music software), imagination is the one thing you must journey deep inside yourself to find. "Cheap computers and powerful software can't make music for you," states Vadim. "That comes from the imagination, from the will to fight for your life, to love and to struggle. These things can't be learned in universities, but they can be discovered within ourselves. So many people live their lives without asking 'why?' or 'if...? We just accept the rules, play the cards we're dealt with. Being diagnosed with cancer gave me a reason to fight for my life. I wasn't going to let the cancer overcome me - my body nor my passion, music. Even with tragedy knocking at the door I looked within myself to create something new. I felt kindness, love and appreciation from so many people around the world praying and sending positive energy. I didn't accept the cards dealt to me and since recovering I feel healthier for it. I now know who my real friends are. I would never wish what I went through on anyone else, but I wouldn't change it for the world because it made me is making me into a better me"
Naturally, 2008 wasn't 100% bad. Amidst the illness, pain and heartache, Vadim managed to tour worldwide with Fat Freddy's Drop, DJ Krush and Slick Rick. And not only did he find, or rather make, time to write a new album, he also discovered new ways to express himself, such as playing keyboards and even 'singing' - or at least putting his vocals through AutoTune, TalkBox and vocoders, an effort to avoid relying on samples and to reach some new ground. "This is something I would never have done ten years ago, let alone on my last album," avers Vadim. "I feel like the album bridges gaps between what is eclectic and what is mainstream, as well as between genres like soul, hip hop, reggae, downtempo and electronica. It's definitely a move towards more electronic sounds from The Soundcatcher" - maybe like Soul2Soul meets Daft Punk." "Music rots when it gets too far from the dance. Poetry atrophies when it gets too far from music." [Ezra Pound]. The Album will be preceded by a single "Hidden Treasure" in April.